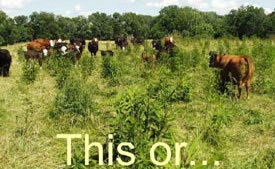 Which pasture would you like to graze? It is important to establish and maintain a strong stand of forages regardless of the grazing patterns. Pastures with poor forage stands are more susceptible to erosion, livestock damage, or weed invasion. A thick, healthy pasture is not only pleasing to the eye, it also allows livestock to more efficiently and utilize the forage. For more information follow the link above this paragraph. Soil test reports can be better understood by reading the Tri-State Fertilizer Recommendation Guide. Grazing methods are also very important to maintain a productive pasture and keep average daily gains up on livestock. For information on developing and maintaining rotational stocking systems, as well as tours of established rotational stocking systems, please follow the link above this paragraph. Copyright © 2007, Purdue University, all rights reserved.